I've got a one-way ticket to fly out of Bangkok on 12 February so I've now got only one more month in Bangkok. Still need to pack, say goodbye to friends and colleagues, practice for and sing in two small performances of a vocal quartet, use up 6 days of leave, finish four publications, and write up my hand-over report for work. That's what you get when you buy lots of beautiful stuff to decorate your home, lead a busy social life, and take all the interesting work opportunities that arise. I could have stuck strictly to my terms of reference at work and spent my time sleeping, reading or watching TV at home after work. But instead I chose to gain as much valuable work experience as I could, travelling extensively in the Asian region. I also kept expanding my musical choral repertoire and got the extraordinary opportunity to participate in professional opera productions, while making new friends and enjoying myself along the way. So no regrets. I'll probably be taking some unfinished work with me during the 6 days of leave I still have to take and back with me to my next destination to finish off later. 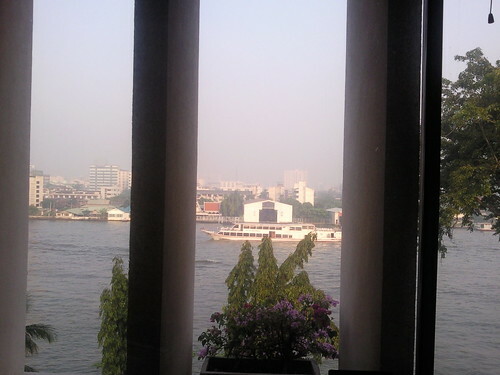 One of the things I'll miss most here: the soothing and luminous view of the Chao Phraya River from my office desk.